I’ve been waffling for the last few weeks over the next warp. My designs are still evolving, which means rapid changes to the required setup. But once your warp is on, you’re committed – for the next few months, until it’s done, that part of the design is fixed. So I have been going around in circles trying to choose my warp. I’m sure you’re shocked, absolutely shocked, by my choice of colors. At some point I will have to move beyond fiery oranges and reds contrasted against deep blues and purples. However, that day is not today, and I’m still enjoying exploring my two favorite color families. I was ready to throw up my hands in despair. 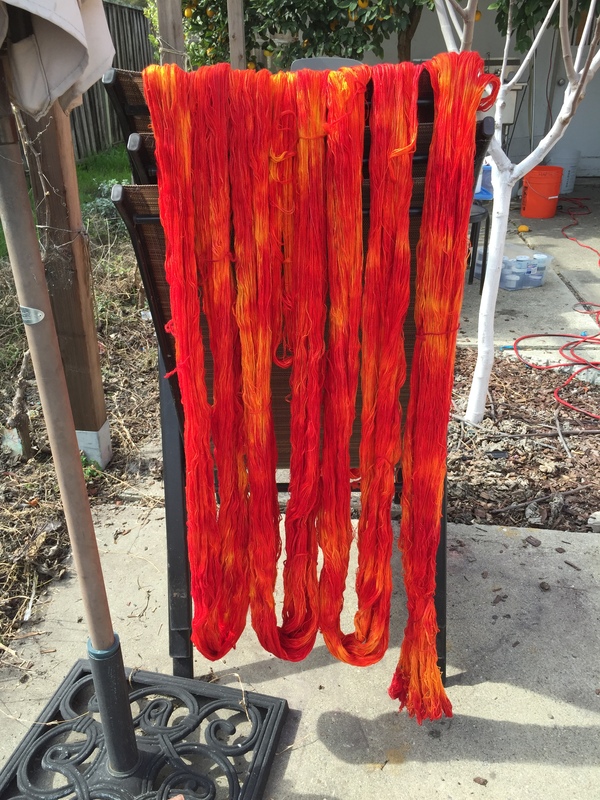 The unmercerized cotton still wasn’t taking dye, even after heavy scouring. I’d have to wind and dye a new warp, substituting a different yarn. Then I took a closer look and realized that I’d fingered the wrong suspect. 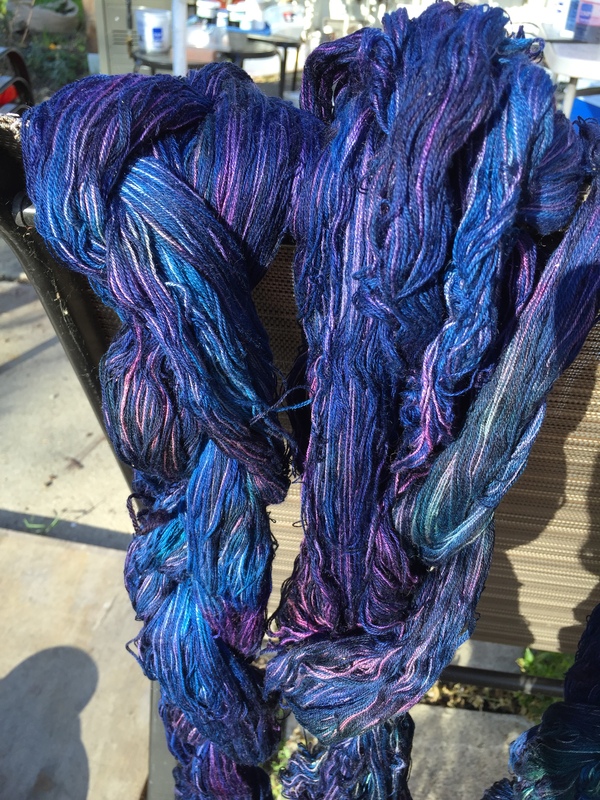 Both cotton yarns had dyed beautifully. 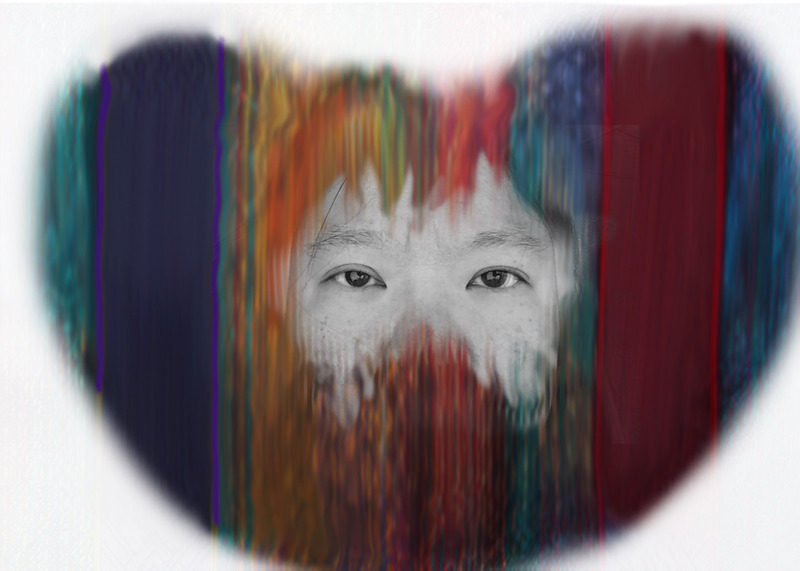 It was the silk that hadn’t absorbed the color. 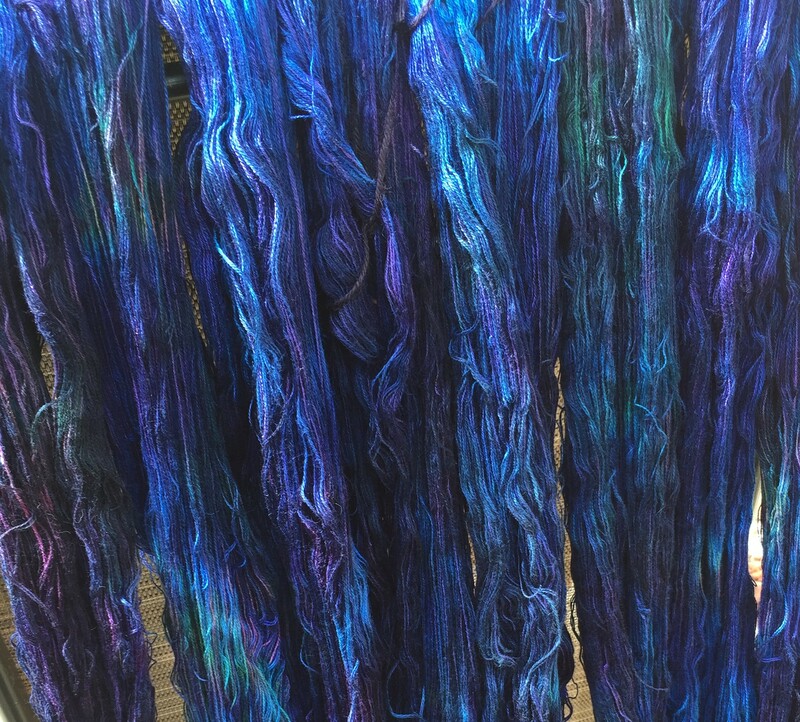 That was a shock, since I’ve dyed silk quite successfully with fiber-reactive dyes before. 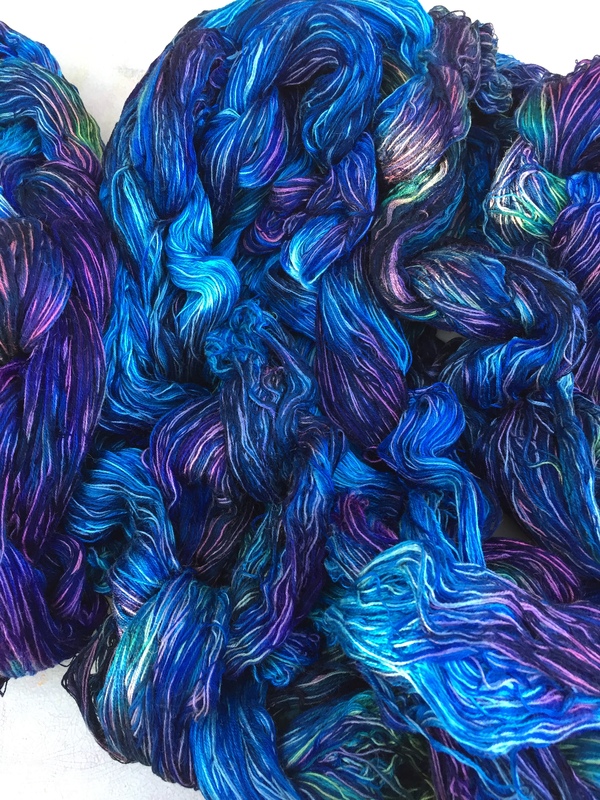 However, that suggested a new line of attack, so I said a few Hail Marys and then dumped the entire warp into a blue/purple dyebath – this time using acid dyes, which are designed for protein fibers such as silk and wool. The silk threads look much more harmonious now. 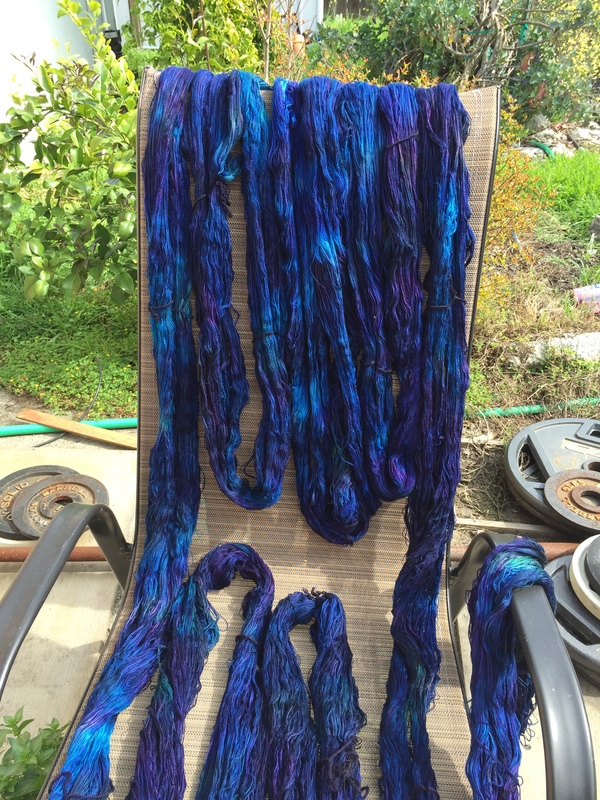 Of course, after three dyebaths and a second scouring, the warp may turn out too tangled to use. But I think there’s hope. We’ll find out once the warp is dry and I can start beaming. At 20 yards, this warp should be sufficient for the three pieces I’m envisioning, all about bipolar disorder. Speaking of which, some people have asked if my current artistic focus means that my own bipolar disorder is resurfacing. No fear, it’s completely under control. (Modern medications are wonderful!) My work is born of the conviction that we (as a society) need to talk more about mental illness, so people understand it better. One of my goals, since I have chosen to be “out” about my own experience, is to open up that conversation, both to educate people and to eliminate the stigma associated with mental illness. This design still needs considerable refinement, but I really like the concept, and will try to do both this and the bipolar brain project on the next warp. Not sure if that’s feasible, though, as both require complicated fabric engineering. The bipolar brain requires weaving two layers of cloth (stitched together in strategic spots and then partially felted). The bipolar prison piece requires three layers, which will mix throughout much of the piece. Figuring out how to make these pieces will be both interesting and challenging! But I am really enjoying the mental gymnastics so far. In other projects, I spent four or five days banging my head against the cat placemat design, sampling and tweaking and sampling and tweaking. But I think I finally have the design right, and am 1/4 of the way through the first placemat. If I finish it tomorrow I will take a quick photo and add it to my show entries for the Complex Weavers’ Complexity and the Convergence Mixed Bag exhibits. I don’t seriously expect they would be accepted in either show, but it’s worth a try. I’m not going to kill myself getting it done, though – Mike is sick right now, so I’m staying well-rested to (hopefully) avoid catching his cold. I am now clearly on the tail end of the current warp, so I may only be able to weave one set of cat placemats. That’s fine with me – they’re amusing, but take a long time to weave. And I’m eager to get on to the next two projects, which have really fired up my imagination.